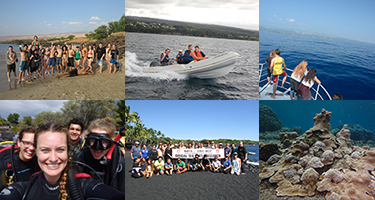 The Marine Option Program (MOP) is driven by students interested in the ocean that surrounds our islands. 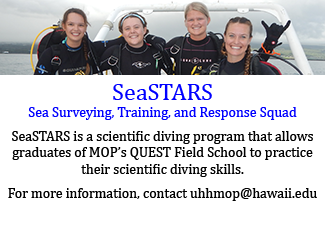 MOP provides hands on, marine-focused experiences for any UH student interested in the ocean, including: turtle tagging, scientific diving, boating, camping, whale and seal counts, and many other ocean-related field trips. MOP offers a certificate program for students of all majors. Enroll in MOP today to begin your journey toward earning a MOP Certificate and gain access to an endless supply of field trips and experiential learning activities. MOP field trips are typically open to any UH student. Please email uhhmop@hawaii.edu if interested in attending. There is always plenty to do with MOP! Check out this semester's field trip schedule! 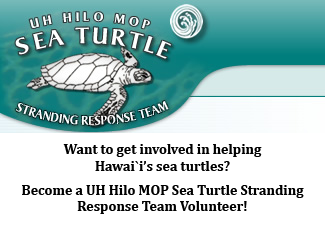 MOPportunities are opportunities to assist in field research, outreach events, and other marine-related activities with various professors and agencies in Hawai`i. In many cases, MOP will help facilitate by providing gear, transportation, or other support. Located on campus (map) between the Life Science and Hawaiian Studies buildings, the MOP Office is a great resource for MOP students. Several computers, whiteboards, and large tables are available for working alone or in study groups. Browse the latest issue of Seawords, MOP's monthly newsletter, to read about current issues in marine science and to see what kind of projects and activities MOP students are currently involved in. Contribute to Seawords by sending articles, photographs, art work, or anything that may be of interest to the marine community in Hawai`i and around the world to seawords@hawaii.edu. The UH Hilo Marine Science degree program has been carefully designed to take full advantage of the unique variety of environments available for study around the island of Hawai`i. 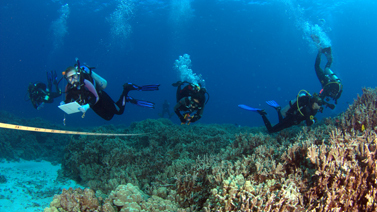 Many of the courses are based heavily in field work, and students are encouraged to get involved in faculty research projects as well as independent projects. The department offers both a Bachelor of the Arts and a Bachelor of Science degree.